The Lake County Musician's Swap Meet is the largest and longest running event of its kind in the SouthEast. The swap meet is in its eighth year at Renninger's Florida Twin Markets and has been in existence since August 2009. MUSIC LOVER'S Jam - runs from Noon until 3 pm. Hosted by Jeff DeHollander and their band. We have one of the best small outdoor stages (with plenty of power) and we provide a PA, mics, guitar amps, bass amp and drum kit for anyone who wishes to get up and perform (by yourself, with our host band or with your own group). We are open to all genres of music. 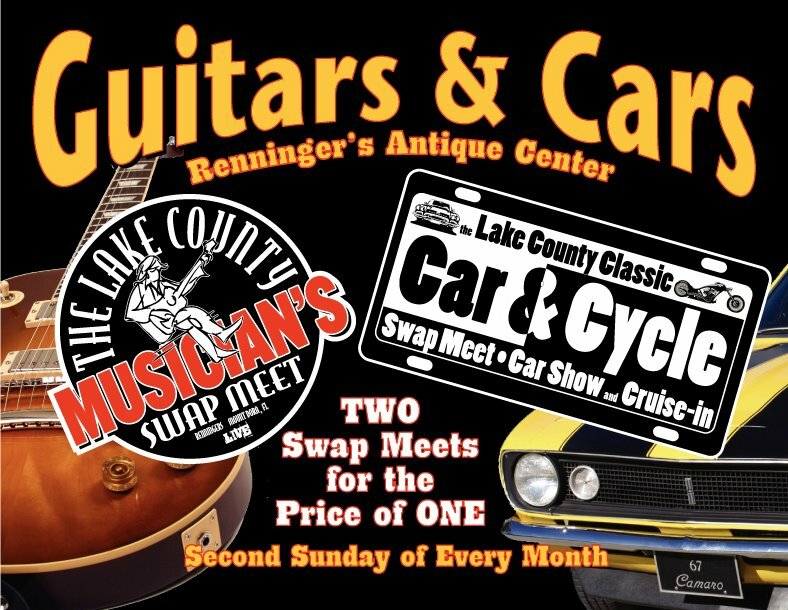 The Lake County Musician's Swap Meet has united with the Lake County Classic Car & Cycle Swap Meet - Car Show and Cruise-in to create GUITARS & CARS - Two Swap Meets for the Price of One! Guitars & Cars is being advertised all over Central Florida on TV, radio, in print, and on the internet (see our 30 second TV spot on the right). Check out the videos of the Lake County Musician's Swap Meet on their YouTube channel (www.YouTube.com/LiveCFL) and on their Video Gallery page. The monthly Lake County Musician's Swap Meet brings together dealers, collectors, musicians and the general public for a day of fun with a little business on the side where everyone can buy, sell or trade musical instruments and equipment, enjoy some good food and play a little music in a great scenic location. Our event takes place on the second Sunday of every month under the big covered pavilion at the Renninger's Florida Twin Markets on Rt. 441 in Mount Dora from 8 am until 3 pm. The Jam Stage is also set aside for manufacturer's presentations. please call 352.735.0025 or email Info@LCMSM.com.